I bought one of these a few months ago and my overall reaction has been……hmmmmmm…..It’s cheap and cheerful I guess but if my iPad 2 and the Nexus 7 were sitting next to me (which they often are) and I was wanting to have a quick browse or check my email (or do anything really) then I’d be picking up the iPad, every time and I’m not entirely sure why. The iPad just seems like a more mature and more grown up tablet with a better underlying OS. Conversely, if I am heading out and about and I usually walk to most places, then I will take the Nexus with me purely because it’s lighter which I suppose sums up the main advantage the Android tablet has over the iPad…it’s lighter and more portable. Not really a great advertisement at the end of the day but others will choose it for its greater degree of customability. A major irritation and one of the reasons why I don’t use the Nexus much is that when you connect it to your laptop, in my case a MacBook Air, nothing happens. It doesn’t show up on your desktop out of the box and therefore you can’t copy music or films or photos or anything , for that matter, across. There must be reasons for this I suppose, I just can’t imagine that they are intended to benefit the actual device owner. I had a look in the Google Play App Store to see if there was some app that could rectify this, the ability to add simple USB mass storage mode but they all seemed a bit convoluted and I wasn’t sure they would actually do what I wanted anyway. Size wise the device is fine but I think I still prefer the bigger form factor of other larger tablets such as the iPad. I thought the Kindle app would be ideal for the Nexus 7 and that the device would be a great eBook reader but now, I’m not so sure, the screen seems a bit small and there’s not as much print on screen as I expected. That was the main reason why I picked one up, I sort of thought it would make a great portable book reader but I suspect the new Kindles will be a far better bet now. Google have done some odd things with some of their apps (so have other developers) as regards display. For example, the Gmail app screen is halved and the right half in portrait shows a list of your emails as it does on a smartphone, the left side of the screen shows some folders. I’d personally prefer to have the email list at 100% of the screen size as I rarely have the need or desire to delve into inboxes/email folders on a mobile device. Perhaps this is the case if the device is rotated but I always lock devices in portrait as I hate seeing the screen rotating if you tilt it more than a nano degree by mistake. The screen is fine but nothing special, the system is speedy though and as a package, with the relatively low cost, it’s an appealing little thing but it just lacks something and I can’t put my finger on it, it’s just a bit dull, perfectly useable but a bit lacking in sparkle. 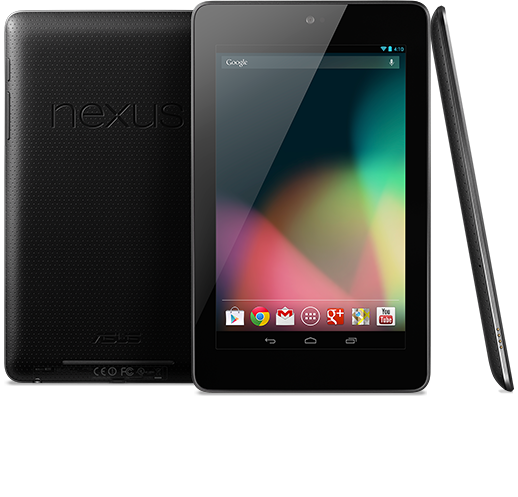 If Apple does bring out a 7 inch iPad then it could obviously affect sales of the Nexus 7, as will the forthcoming Amazon tablets, depending on the cost. Ever since Android 3.0, you’ll need the Android Transfer App for your Mac to see the device. It’s because Google changed to MTP as the protocol. http://www.android.com/filetransfer/ Hope that helps a little.